If you are a designer or freelancer, you probably already know that having online portfolio is very essential. 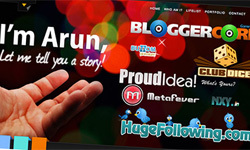 They are not only just create a platform to your work but also create your online presence. If you leave an address of your portfolio when you’re communicating in social media, through blog comments, contests and so on, you’ll see that you can even get work from that alone. So for your inspiration, her we’ve collected 50+ examples of online portfolios that stand out as clever, creative and inspiring.